Yeoal's Blogzine™| Nigerian Urban, Gossip and Entertainment Site: Bill and Melinda Gates were once considered running mates to Hilary Clinton? 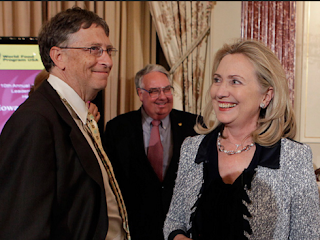 Bill and Melinda Gates were once considered running mates to Hilary Clinton? According to a leaked email obtained by Wikileaks, an email which was sent on March 17, 2016,Hilary Clinton’s aides sent a list of names of possible candidates for VP and Microsoft’s Bill Gates and his wife Melinda Gates were considered. Also considered were Apple’s Tim Cook, Starbucks’ Howard Schultz and Mayor of New York, Michael Bloomberg. She instead settled for Sen. Tim Kaine of Virginia. Bill Gates once revealed he would “approach any new administration with a positive open mind,” but also added that he already has experience working with Clinton through the Clinton Foundation. While his wife, Melinda Gates said she keeps her votes private, but said seeing a woman in the White House would be fantastic.